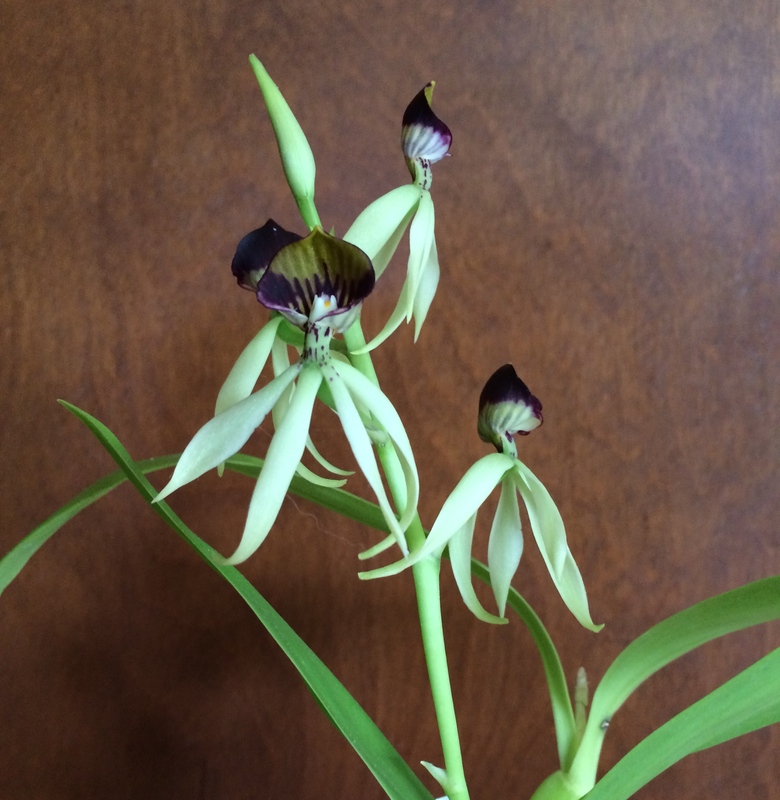 This orchid is Encyclia “Green Hornet.” My husband and a few friends have described it as “creepy,” “weird” and “cartoonish.” I think it’s cool, interesting and beautiful. It is consistently hot and humid in our area these days, and the orchids are loving it, as long as we leave the ceiling fan on to keep the air moving. Good air circulation is one of the keys to orchid happiness. This hybrid is about eight inches tall, and likes bright light and a bit more water when it’s in flower. Easy to grow, though. Blc “Hawaiian Sunset,” a cattleya hybrid, grows well on a table in a south-facing window. I took this photo, appropriately, at sunset. 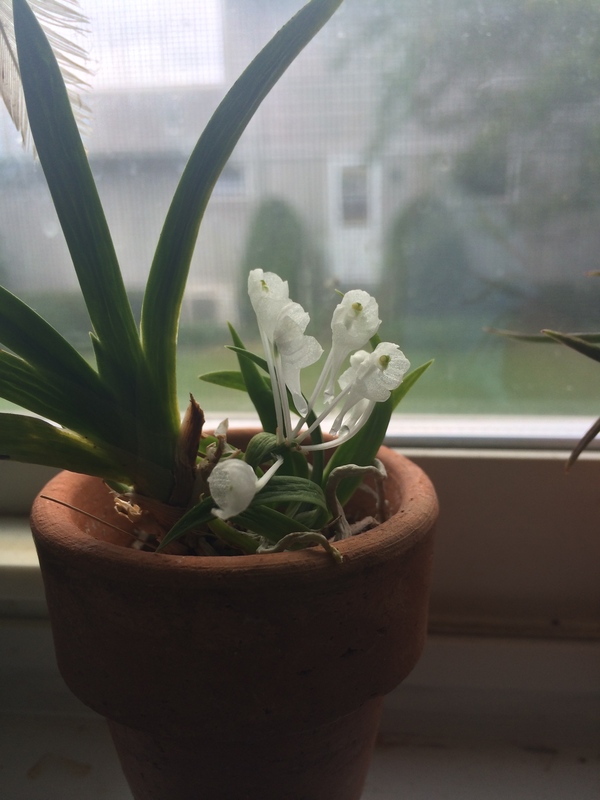 I won this orchid in a drawing at an orchid club meeting, and it has been a reliable bloomer. I don’t usually have much success with cattleyas, and I am not really fond of many of them, so this is the only one in my collection. Finally, a miniature, Podangis Dactyloceras, one of my kitchen windowsill companions. This is a species from Western Africa. Its sharp, fan-shaped leaves make it look almost like a cactus. Each inflorescence carries a cluster of small, translucent white blooms with green centers. There’s a second spike on the other side of the crown. 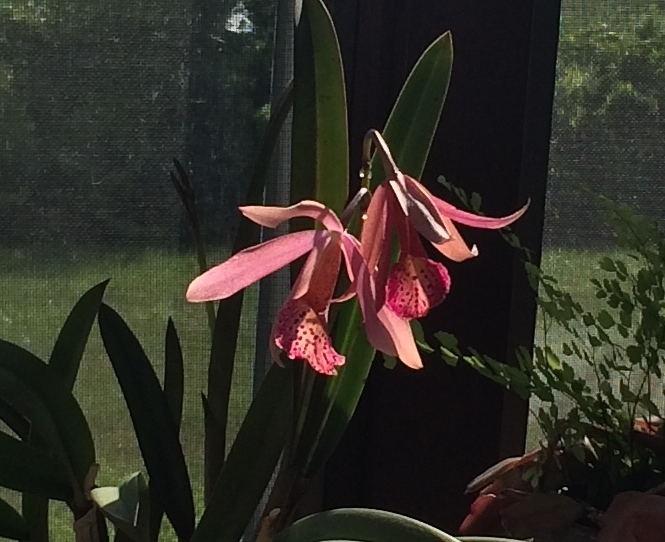 It has been a reliable bloomer for me since I bought it at an orchid show several years ago. When non-orchid growing friends see one of my more unusual plants, they often say ” it doesn’t look like an orchid.” One of the reasons I grow orchids is because they are so incredibly diverse. It kind of boggles my mind. what does a proverbial orchid look like? A Cymbidium? I have a volunteer wild orchid, 2 slippers, a Dendrobium and some proverbial cymbidiums. I supposed I’m referring to the more common phaelanopsis and cattelya types that everyone in this country seems to recognize. Cymbidiums are very “orchidy” looking, too. Beautiful, Cynthia! I love the color on Hawaiian Sunset. When I choose a new orchid now, I go for the unusual, either in flower shape or color. Since you introduced me to these lovely, easy to care for plants, I have tried so hard to be judicious in what I add to the collection! 🙂 I’ve noticed they seem extra thirsty this year; have you? Mine haven’t been thirstier than usual, except when it’s really hot. But then aren’t we all? I have found that a lot depends on the medium. Good, fresh medium holds water better and longer than tired old stuff. You are definitely hooked. Just give in and go with it. Your reblooming skills are awesome, dn. Thanks, CJ, but these are easy re-bloomers. I can’t take all the credit. Thanks! Maybe I’ll repot a couple of those that seem especially thirsty; they’ve been in the same medium for about 2 years. I potted them bare root from a grower. Try the Aussie Gold medium from Kelly’s Korner. I order mine from them. It can be hard to strike a balance between good drainage and moisture retention.